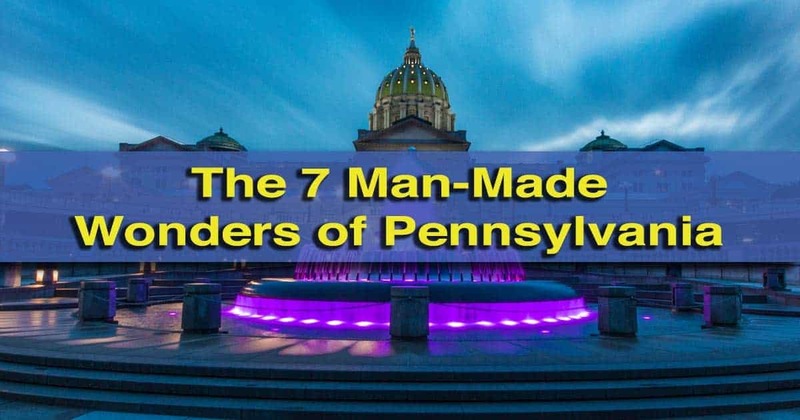 Pennsylvania is home to many of the most amazing man-made structures in the United States. 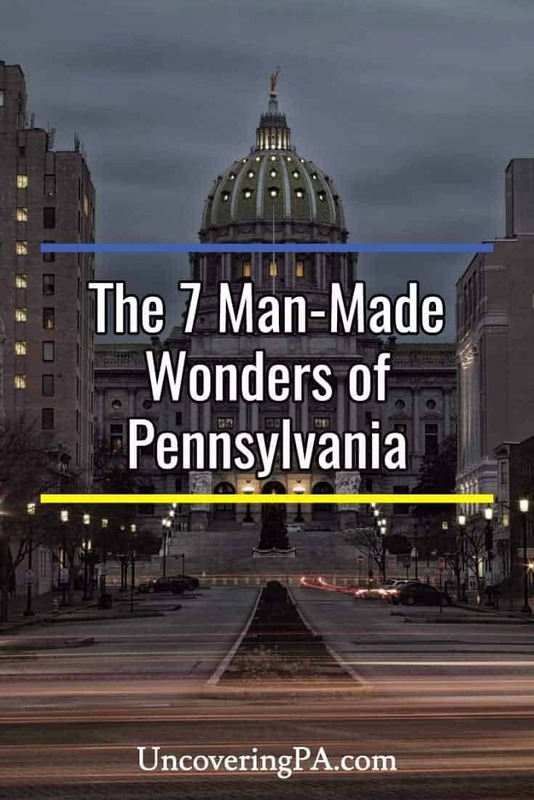 I recently covered the 7 Natural Wonders of Pennsylvania, and today am going to list what I believe to be the 7 Man-Made Wonders of Pennsylvania. The criteria for this list was simple. The structure had to have been significant in some way and be an impressive sight. I’m also only considering structures that still exist. Maybe someday soon I’ll do the 7 Lost Wonders of Pennsylvania. Philadelphia City Hall was once the tallest building in the world. Amongst the many towering buildings in Pennsylvania, Philadelphia City Hall is special. Built between 1871 and 1901, it took 30 years to complete the building. 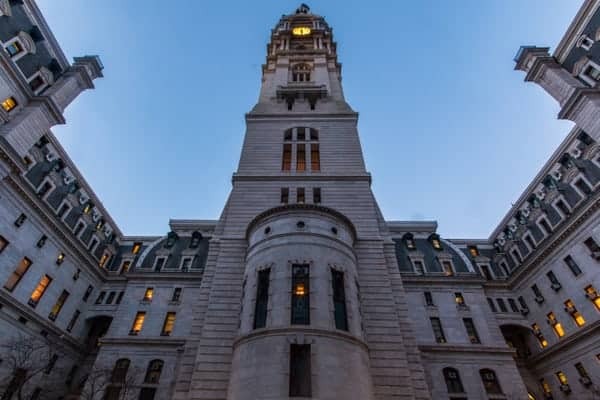 However, when the exterior was finished in 1894, Philadelphia City Hall became the tallest habitable building in the world (at 548 feet), a title that it would retain until 1908. Today it still remains the tallest masonry building in the world, and one of the largest municipal buildings in the world with more than 700 rooms. Even cooler, the iconic William Penn statue atop city hall is the world’s largest statue that crowns a building. Visitors wanting to get a close up look at the building can tour the inside, and even visit the small observation deck directly under William Penn’s feet. 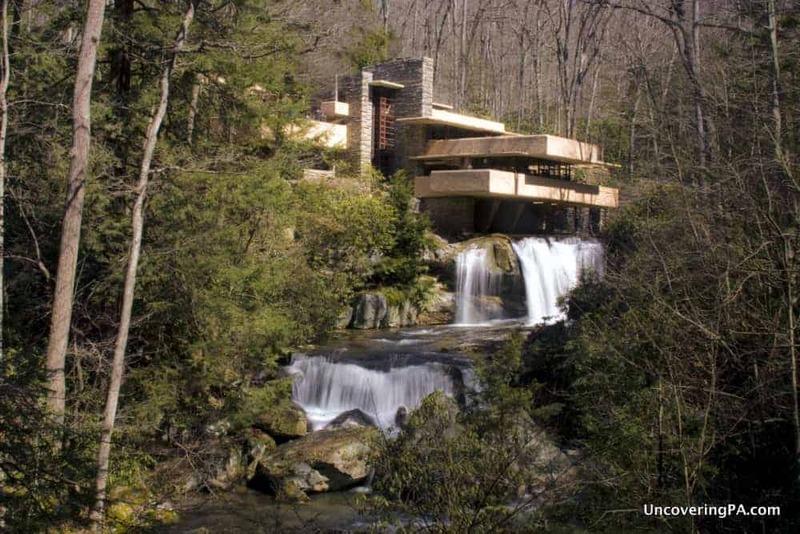 Frank Lloyd Wright’s Fallingwater is one of Pennsylvania’s most well-known structures. The most famous house in the state is certainly deserving of a spot on our list of seven man-made wonders in Pennsylvania. Built by legendary architect Frank Lloyd Wright between 1935 and 1939, the home’s most distinguishing feature is its location next to a beautiful waterfall along Bear Run. Located in southwestern PA, Fallingwater was opened to the public in 1964 and is now one of the most popular tourist attractions in Pennsylvania. Find out more about touring Fallingwater here and touring the grounds here. 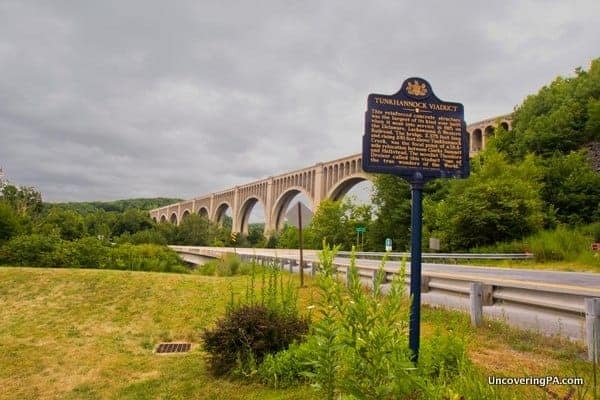 The Tunkhannock Viaduct was once the largest concrete structure in the world. Pennsylvania’s mountains and valleys posed many challenges for railroad operators, and the Tunkhannock Viaduct is the first of three railroad-related sites on this list. When it was completed in 1915, it was the largest concrete structure in the world. 100 years later, trains still travel the 2,375 feet over the borough of Nicholson, Pennsylvania, and the Tunkhannock Creek. The bridge contains 10 spans and reaches a height of 240 feet above the valley floor. A visit to Nicholson is worthwhile just to stare at this massive structure passing overhead. It’s even more impressive when you learn that almost half of the structure is below ground. Find out more in our piece about the Tunkhannock Viaduct. The dome, which was inspired by St. Peter’s Basilica in Rome, is 272 feet in height and is topped by a 14-foot gilded statue known as “Commonwealth.” In the capitol’s interior, the floors are made with Moravian tiles from the Doylestown workshop of Henry Chapman Mercer. Visitors wanting to see more can tour the inside of the Capitol as well as its grounds. The beautiful Cathedral of Learning towers over the University of Pittsburgh. The Cathedral of Learning in Pittsburgh is the world’s second tallest university building, at 535 feet in height. 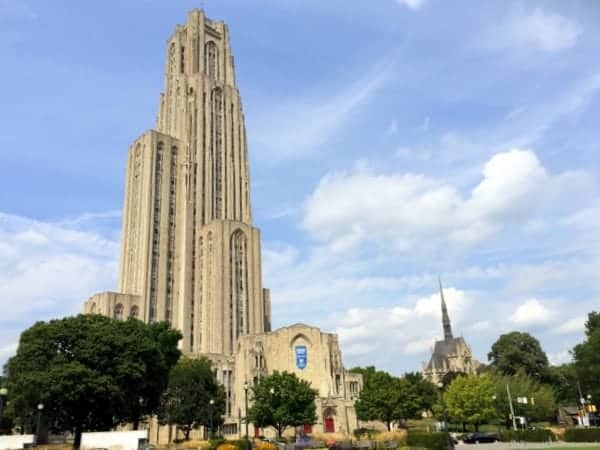 Opened in 1931 and completed in 1937, this building towers above the rest of the University of Pittsburgh. In addition to its impressive height and late gothic revival architecture, the building’s interior also holds several special rooms. The first is the Commons Room, a study room that wouldn’t look out of place in a Harry Potter film. Surrounding the Commons Room are the Nationality Rooms. Located on the first and third floors of the building, these 30 classrooms have been designed in the style of a variety of nationalities from around the world. Take a tour of the world without leaving the Cathedral of Learning. Check out our full article about visiting the Cathedral of Learning and the Nationality rooms. 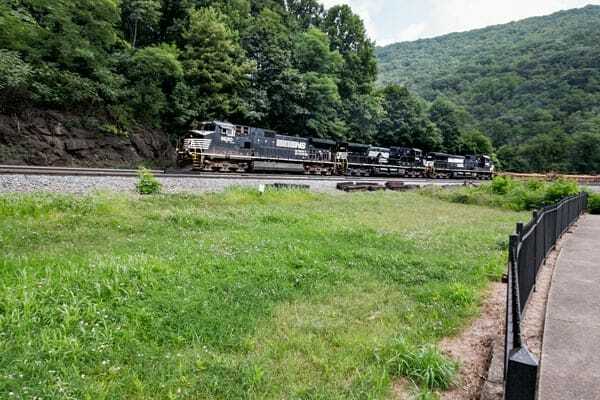 A freight train travels through the Horseshoe Curve. To the uninitiated, the Horseshoe Curve located outside of Altoona might look like just another railroad track. 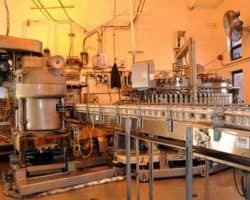 However, it is actually one of the most important engineering feats of the 19th century. Prior to 1834, travel from Philadelphia to Pittsburgh, and points further west, was an arduous journey that could take as long as three weeks to complete. In 1834, the Allegheny Portage Railroad opened, cutting that time to four days. However, in 1854, the Horseshoe Curve was completed, allowing trains to climb the Allegheny Mountains, cutting the travel time across the state even more significantly. Even 160 years after its completion, the Horseshoe Curve is still an important rail link across the state of Pennsylvania. 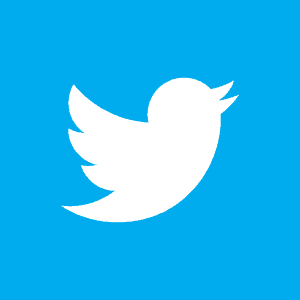 During World War II, it was deemed so vital to the war effort that it was targeted by Nazi saboteurs. Visitors wanting a closer look can ride a short funicular to the top of the hill, where an observation area allows an unobstructed view of the nearly 2,500 foot long curve. Click here to find out more about visiting. Beaver Stadium in State College, Pennsylvania, is the world’s third largest stadium. The home of Penn State football in State College, Beaver Stadium is one of the biggest draws in the state. It is also the 2nd largest stadium in the western hemisphere and the third largest stadium in the world with a seating capacity of nearly 107,000. To put it in perspective, when the stadium is filled on game days, it becomes the fourth largest town in Pennsylvania, behind only Philadelphia, Pittsburgh, and Allentown. 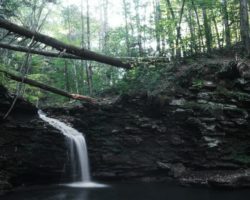 Don’t forget to check out my picks for the 7 Natural Wonders of Pennsylvania. Good list. 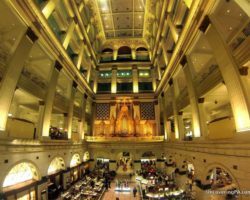 When you get a chance, check out the Masonic Temple at One North Broad Street, Philadelphia. A real gem in downtown Philly. I thought about including it, but obviously some good things couldn’t make the cut. And what about Raystown Dam? It’s insulting to us in Huntingdon County you failed to recognize this. Sorry you feel that way, Jeff. 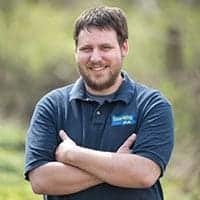 I did considered the dam at Raystown Lake, as well as the larger Kinzua Dam in northwestern PA, but ultimately felt the places on the list were the top seven. I probably would have included one or both if I’d made it a top ten. Nice job Jim! Love the facts you added about each … Beaver stadium 4th largest city when full? Wow! Keep up the good work, always enjoy hearing new things in our own backyards! How about the Incline Plane in Johnstown? 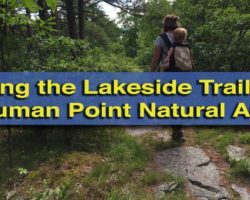 I was expecting to see Kinzua Bridge in this list. I know making lists is a subjective task, but Kinzua was the largest of its kind in the world when built, the ruins from the tornado are awe inspiring and is more accessible to visitors and more prominent in my opinion than Beaver Stadium. If Kinzua Bridge had still been intact, it probably would have made the list. I chose Beaver Stadium because it’s the third largest stadium in the world. That seemed like a pretty amazing distinction. Also Longwood Gardens, which has one of the largest Fountain shows in the world and wins national awards yearly. 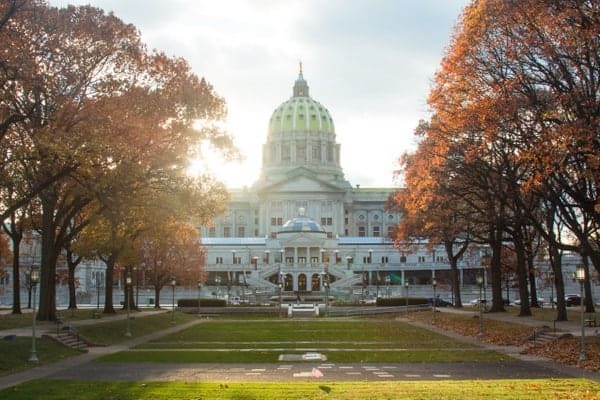 I was glad to see that both Horseshoe Curve and the marvelous tile floor in the Capitol building made the list. Pennslyvania Academy of Fine Arts or UPenn.’s Fine Arts Library – both great architecture by Frank Furness.